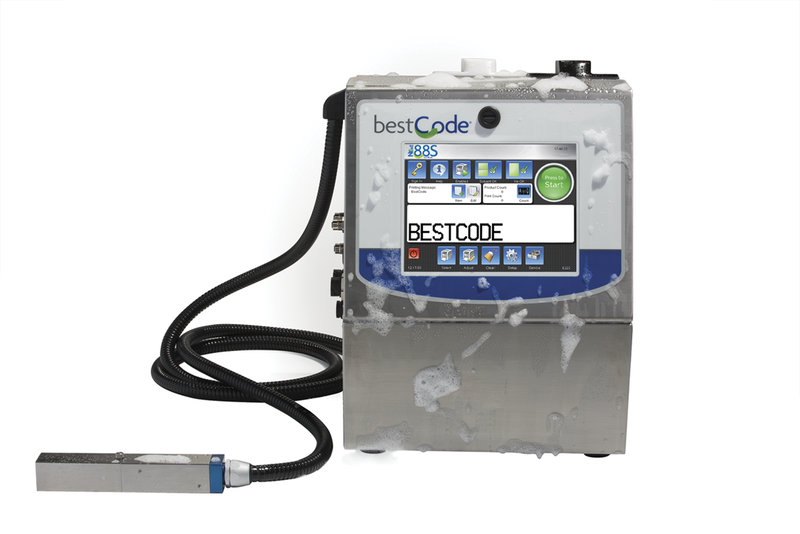 The BestCode Model 88S Extreme is enclosed in a 316 Grade Stainless Steel corrosion resistant enclosure. System can be order with option positive air system to operate in the most extreme wet or high dust applications found in food and beverage manufacture as well as in industrial applications. 1, 2, 3, 4 or 5 lines of text, barcodes or graphics. A complete range of dye and soft pigmented inks available in a variety of colors for a wide range of applications. Typical applications mark and code one, two or three shifts per day or 24/7 operations , five to seven days per week, averaging 4,000 — 8,760 hour annual operation. Utilize integrated RS232 and programmable inputs\outputs for remote control and communications. Any 88S specialized solution system—88S Opaque, 88S Micro, 88S Food Grade, 88S High Speed and 88S Ultra High Speed— are available with the 88S Extreme package.